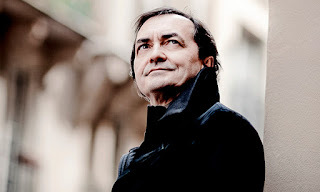 Last night French pianist Pierre-Laurent Aimard returned to Herbst Theatre, giving his second Piano Series recital for San Francisco Performances (SFP) since he made his SFP debut at the end of March of 2012. For his debut Aimard prepared a program of considerable breadth, with the early nineteenth century of Robert Schumann at one end at the recent past of György Kurtág at the other. This time he went for depth, rather than breadth. The major work on the program was Ludwig van Beethoven’s Opus 106 (“Hammerklavier”) sonata in B-flat major, which occupied the entire second half of the program. The first half, on the other hand, was devoted almost entirely to György Ligeti’s imaginative cycle of eleven solo piano compositions, Musica ricercata. As if this coupling of Ligeti and Beethoven were not enough, Aimard chose to begin with “Le Courlis cendré” (the Eurasian curlew), the last of the thirteen solo piano compositions that Olivier Messiaen collected in his Catalogue d’oiseaux (catalog of birds). This made for an evening replete with some of the most imposing technical challenges in the piano literature. Aimard’s impeccable capacity for technique was clearly up for all of those challenges, but his performance was far more than an exhibition of jumping through burning hoops. Aimard also has a keen aesthetic foundation upon which he knows how to tease out the expressive side of everything he plays. That skill was immediately apparent from the very beginning of the program. As Eric Bromberger put it in his notes for the program book, each of the pieces in Messiaen’s “catalog” is “a small music drama set in a specific location.” The bird identified in the title is the “leading character;” but the piece itself develops the sense of the animal in its proper environment, assigning different motifs for each of the elements of that environment (primarily the other birds in the region). “Le Courlis cendré” is the last “dramatic journey” in the set; and the overall setting is a rich one. Aimard knew exactly how to lead the attentive listener through every detail of that setting in a manner that would provoke and then satisfy curiosity. This opening selection was very much a harbinger of things to come. Musica ricercata is probably best translated as “researched music;” and, from a structural point of view, one might almost say that the score reads like a laboratory notebook. The “laboratory experiment” consists of working with limited numbers of pitch classes, starting with only one with a second introduced at the very end. By the time the eleventh piece is encountered, the entire chromatic scale is in play. However, this is far from a traversal of an abstract path, similar to traversals of all of the major and minor keys encountered in any number of earlier compositions going back at least as far as Johann Sebastian Bach. Instead, Ligeti develops his own “mini-drama” for each of the eleven pieces; and it would be fair to hypothesize that each of those pieces is a reflection on some past listening experience. Thus, one encounters a wide diversity of styles, along with two composers explicitly named in the titles of the pieces, Béla Bartók and Girolamo Frescobaldi. In other words, if Musical ricercata is a laboratory notebook, it amounts to systematic documentation of Ligeti’s own approaches to making and listening to music. While the Bartók selection is a memorial one, there is no shortage of wit for the listener to encounter as the cycle unfolds. Where humor is concerned, Ligeti is capable of eliciting everything from a sly chuckle to a robust belly laugh. Unfortunately, that sense of humor tends to get hidden behind the technical demands, which get increasingly challenging as the cycle progresses. Then, of course, there is the punch line for the whole cycle that brings us back to the name of the collection. The title of the final piece is “Omaggio a Girolamo Frescobaldi.” This is a study in imitative counterpoint, whose subject is a twelve-tone row that is given a descending chromatic scale as a countersubject. (Yes, I am avoiding the noun “fugue,” due to my old-fashioned bias for a fugue in which the tonal subject is answered at the dominant.) Frescobaldi composed many similar pieces that explored such an imitative process. He and his contemporaries often called such imitative compositions “ricercars.” Cue the laughter from the informed audience! An intermission was clearly necessary before Aimard could get down to business with his Beethoven. Nevertheless, I doubt that anyone drawn into the first half of the program could have cleared his/her mind of all those auditory encounters with Messiaen and Ligeti. I would therefore humbly submit that Aimard wanted us to listen to Beethoven with ears that had just been informed by those two far more recent composers. Sometimes this was little more than a matter of surface structure. There is that tremolo moment in the Scherzo (second) movement that usually sounds like a brash interruption of the frolicking rhetoric. This time it sounded more like one of Messiaen’s birds having wandered into the wrong place at the wrong time. Then of course there are the two fugues, the “little one” in the development section of the opening Allegro and the Allegro risoluto “big one” that dominates the final movement. These reminded the alert listener of just how far we have advanced from those Frescobaldi ricercars. However, even below these more obvious features, Aimard played his Beethoven in such a way that one could appreciate just how much his approach to playing any form of music had been informed by the “training ground” of Ligeti’s Musica ricercata. The audience clearly would not let Aimard leave without playing an encore. He explained that the only proper way to follow the “Hammerklavier” was with silence. Rather than turn to John Cage, he selected three of the shortest pieces from Kurtág’s Játékok (games) collection. Aimard played seven pieces from this collection at his debut recital, but I am afraid that I cannot remember if last night’s pieces revisited any of them. What was more important is that he allowed a calming spirit of quietude to settle in after a stormy evening of technical and expressive challenges, all of which had been impressively dispatched by Aimard’s consummate musicianship.